An organization which supports the national parks says it did not lobby a Wisconsin congressman for a slice of the House stimulus package. Tom Martin with the National Parks Conservation Association says they&apos;re pleased the House passed an economic stimulus package which includes more than $2 billion for the parks. 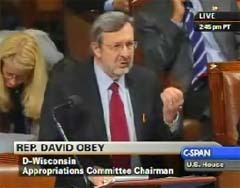 And Martin says the fact that House Appropriations Committee chair, Wisconsin Congressman Dave Obey , is father of the Association&apos;s Senior V-P for Government Affairs Craig Obey, had nothing to do with it. A House Republican (Rep. Darrell Issa ) is now demanding an investigation into whether the two billion is proper, given the relationship of the two Obeys.